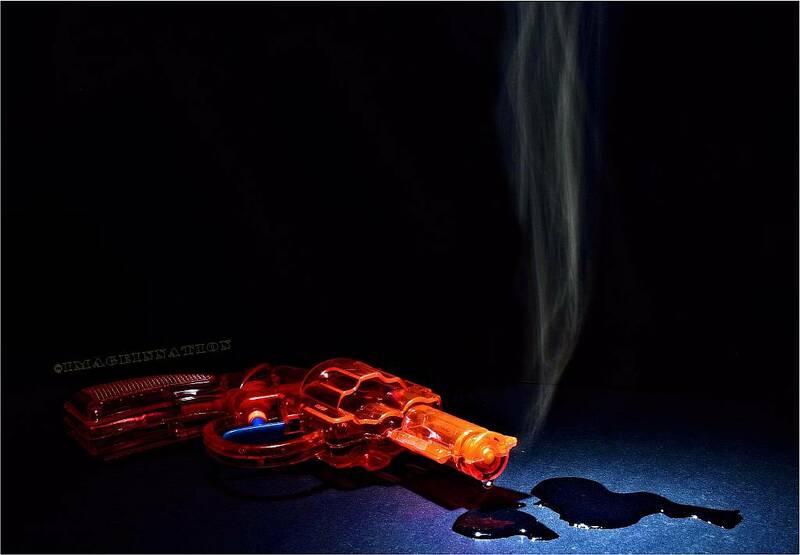 Smokin’… A cool smoke effect for your photographs. You will need a small torch (I used an LED torch as the light is whiter than an ordinary bulb), a piece of string, length depending on the height of your background and a plain background. Firstly, position the background in a suitable place. You will need a dark room as this is going to be a long exposure and you don’t want any stray light affecting your images. As my subjects were not too big I used some black paper covered foam craft boards. These are available at any office supplies store very cheaply. Then attach one end of the string to the bottom of the torch by tying or use sticky tape. Set your camera on the tripod. I used a 28mm prime lens as it gives great, sharp images but any lens will do the trick. Set the ISO to as low as your camera will go. An ISO of 100 or less is great. Make sure your camera is in manual mode. Set the time value to 10 secs and F11. Pre-focus on the subject in with the lights on in the room and then switch your lens to manual focus. This way, you will not lose the focus when the lights go out and press the shutter. Hold the torch above the subject and let the string dangle below the torch and around the subject. Turn on the torch and turn out the lights. Push the shutter release and within the 10 secs, drape and slowly move the string above, around and over the subject. As you are moving the string, this is not fully captured by the sensor and creates a blurring of the string. This results in a misty effect that looks like smoke rising out of the subject. The torch is acting as the light source so can give some lovely shadows that can make the shot look very effective. Try it using different subjects. It can look good with smoke coming from a hand or fruit or even ice! 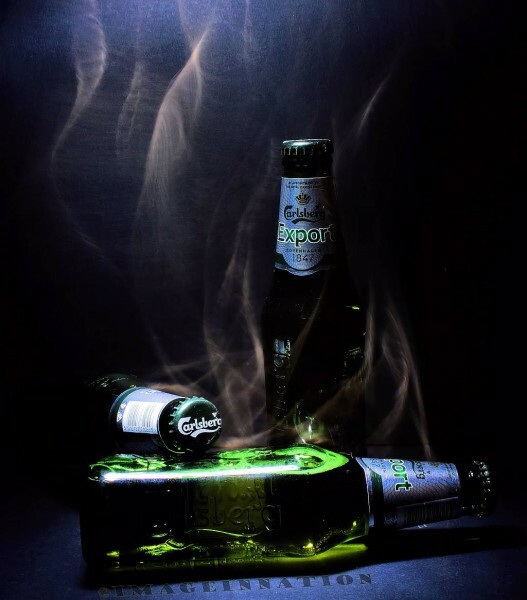 Bottles behavin’ badly… a smoky atmospheric shot. It can take a few practice shots to get the speed of the string right. If you twirl the string so it moves too fast, the sensor will not pick it up. Then you will not see it. Too slow means you will see the string as string and not smoke! This entry was posted in Camera control, Composition, Guest Contribution, How to..., Light and Lighting, Things to try, Tips Tutorials & Techniques and tagged Creativity, Effects, How to Shoot, ISO, Lens, Light, Manual Control, Shutter Speed, Smoke. Bookmark the permalink.